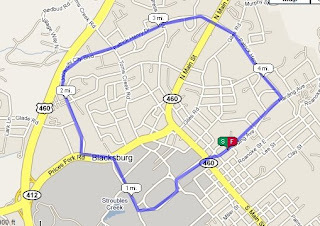 My run today was three loops of the route below. I felt like I pushed and did my best. My intention, as Jake suggested, was to have each lap faster than the previous one but I screwed up by starting too fast overall and lap 2 ended up the fastest. Then I just went for steady on the first half of lap 3 just to be sure I'd have enough gas and not feel beat up mentally. Energy level was decent throughout and sustained through the end. I had two powergels along the way at the end of laps 1 and 2. (Breakfast was 1/2 c. (before cooked) oatmeal w/ strawberries). The route was anything but "fast and flat" (see below) so I think the times were OK (not great) considering. However, this is the wake-up call that I will have to work pretty hard to meet my goal in Roanoke. It won't be a cakewalk. Today's speed workout - 1/2 m x 10! !